First off, Haglund's deformity is an extra bony growth on the heel, typically a little lateral to the Achilles tendon. It is not to be confused with a heel spur which is under the foot. A technical definition of Haglund's deformity would be an abnormal prominence of the posterosuperior border of the calcaneous. If you have this heel bump you may not have known the name, but you would have certainly felt it! It would have rubbed on your shoes and gotten inflamed, or maybe you repeatedly wear through the back of your shoes on the inside. Luckily, there is surgery available to correct this if it's really bothersome. The inflammation, a bursitis of the back of the heel, is called Haglund's syndrome. It's thought that the inflammation actually leads to the bony growth, not the other way around. Nonetheless, the rubbing and pain is worst in shoes with rigid heels. Since I figured out I was a little abnormal in 2013 (I can't believe it took that long either...) I've been modifying my shoes so that I don't wear out my heels or the backs of my shoes. I have two methods for this. The first method is to simply cut a hole in the back of my shoe where the growth on my heel is. This works, but it isn't pretty and wouldn't work well for trails. 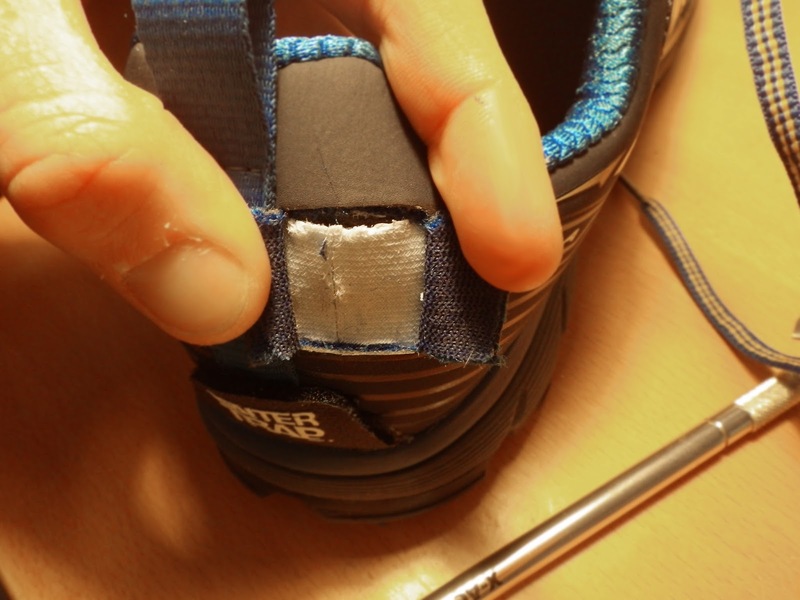 I've only done this modification once, on a pair of road shoes where the inside fabric was already wearing through (see below). Be careful with cutting through the hard plastic - I found cutting pliers can be useful, along with an x-acto knife/scalpel. Method 1 - cut a hole and leave it open. Sew around the edge if you want. The second method has proven quite reliable and comfortable, though it involves a little more work. I cut in through the back of the shoe, snip out some of the hard plastic making sure to keep the inner fabric intact, then sew up the incision site. 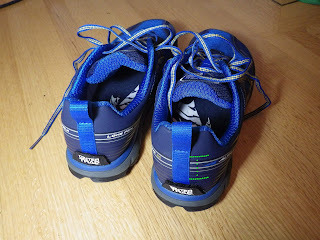 Step by step instructions follow below where I cut into a new pair of Altra Lone Peak 3.0's. Keep in mind this may decrease the stability of the shoe. Also it will void your ability to return the shoes, which is a bit of a problem since this modification is best done when you first get the shoes and the inside fabric hasn't been worn at all. Step 1 - draw on your cut. Step 1 is to figure out where you're going to cut. For me this is a little lateral to midline, and about the middle third of the height of the shoe (2cm). At the top and bottom of this we need to cut left and right about 1 cm, making an "I". Ideally, the top incision should be just at the top of the hard plastic inside - you can feel this by bending the top of the heel of the shoe. Step 2 is to cut! Cut in so that you get to the plastic, but don't go through it into the inner fabric. glued on layer of fabric. Step 3 is to remove the plastic. Take care to separate the inner fabric from the plastic if it's glued on, that way you don't damage it. Use your knife or your snipping pliers to remove a "U" shaped piece of plastic approximately where your heel deformity is. Make sure the piece you're taking out is as large or larger than your bump. Step 4 is to double check that enough plastic has been removed and in the right spot. So, put on your shoe and lace it up. Feel the back of the shoe for your heel bump relative to the area without plastic. If they don't line up or there is still some plastic rubbing your heel, take that out too. All done. Not pretty, but it works! Step 5 is to close it up and sew the flaps together. To ensure the flaps don't rip open I use upholstery thread (Tex 75) as it's super strong, though I'm sure normal thread would work too. As I'm sewing, I only go through the outer layers to keep the inner layer intact; this seems to do the trick. A pair of pliers can be handy if the shoe material takes a lot of effort to punch through with your needle/thread combo, just make sure to use non-cutting pliers! Also, to save time, only sew the vertical cut as the horizontal ones don't seem to matter much. Thanks Jack! Let me know if you have any questions. I'm happy to answer them! You can always blame this sort of thing on genetics...that is, it's your parents' fault! Personally I think you got your bad feet from your Mother! This is an excellent post and I found it really helpful! I play football and I only recently started suffering from Haglund’s deformity. I was trying to manage it by taking painkillers whenever I had to wear my football boots but this was not a realistic long term method of dealing with the issue. Today I cut a hole in the heel of my right football boot in order to see if it will make a difference going forward. The bump on my heel is high enough, therefore the hole I cut is similar enough to your first picture. Would you say it affects the durability of the footwear doing this? It definitely relieves the pain anyway so I’m not complaining but would you have any tips to increase durability? I haven't found that the modification greatly affects the durability of the shoes. I would assume the 'hole' method, as in the top picture, does decrease the strength of the shoe, but that top ridge part hasn't ripped yet. The second method certainly seems more sturdy, but as I said, haven't had issues with either yet. Let me know what your experience is re: durability. Great post! I've been struggling with what I've believed to be insertional achilles tendonitis of my right foot for well over a year now. 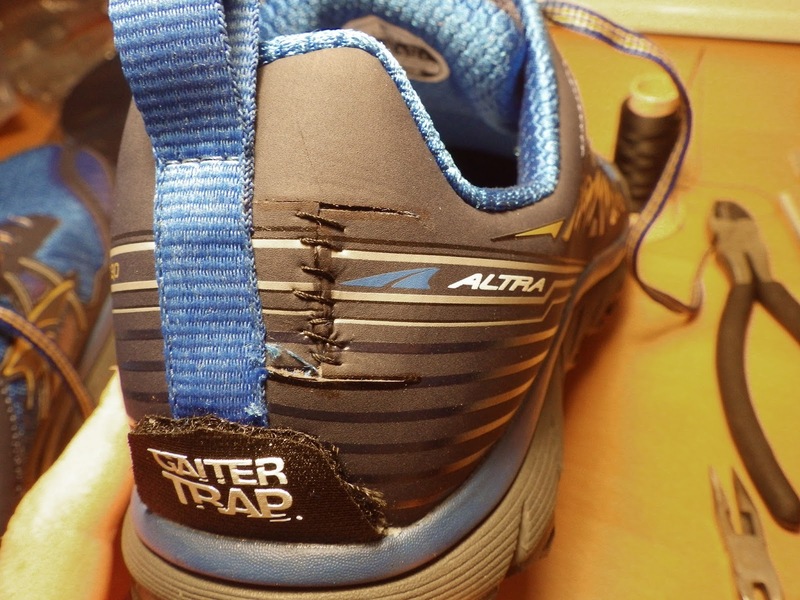 I feel like I've tried everything short of surgery to no avail, but this morning in a fit of frustration made a deep slice all the way down the heel of an old pair of Altra Superiors. Boom; heel pain gone. Googled my way here and glad to see something that seems to validate my approach -- although your approach seems must more elegant :). Might give it a try on a newer pair of shoes. Thanks again. Hi Brendan! Glad you were able to solve your heel pain. Let us know if you try out this technique for modifying your shoes and how it goes, or if you have any suggestions!